For those nights when you get home hungry, stressed, and impatient, Hangry is here to help. Each Monday, Kendra Vaculin will share quick, exciting meals to rescue anyone who might be anxiously eyeing a box of minute rice. Today: Hot? Sweaty? Drink some whiskey punch and you'll stop complaining. With it’s stereotypical lack of ceremony, the city of New York has transitioned between its two seasons, from Ice Tundra Vortex to Hot Sticky Garbage Pit of Fire. Though the calendar has yet to catch up, the millions of us melting on the subway platform and wedging A.C. units into our windows know that we are squarely in the throes of summer. Salvation for concrete jungle animals everywhere comes in the form of little pockets of fresh air, courtesy of the urban planning gods of yore: city parks. New York has its fair share of smaller ones (I log miles around Stuyvesant Square during workweek iced coffee breaks) in addition to the behemoths, which means you’re never too far from a shady flowerbed or a grassy knoll. Parks allow you to forget, for however brief a time, the hectic world around you; especially if you can’t see the traffic for the trees, it’s easy to resolve to never go home. As the secret weapon in your survival kit for never leaving the park, I present to you whiskey punch. It’s basically a sparkly Arnold Palmer—except honey-spiked and with whiskey instead of tea. 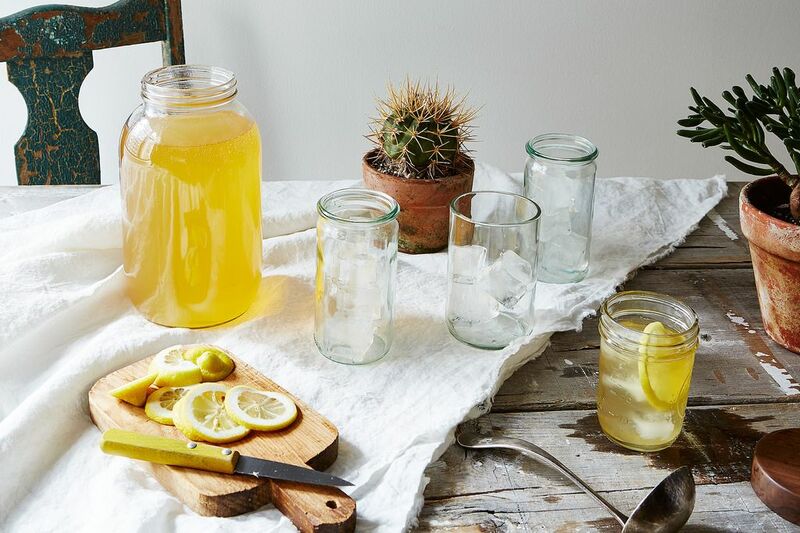 A big plastic jug of this (plus some plastic cups and a bag of ice) should be a picnic prerequisite— refreshing, sweet in the good way, and light enough to have a few over the course of the afternoon. I promise that with a cup full of whiskey punch, the heat won’t seem so bad. A fan of female driven comedies, a good beat, your hair today, and making foods for friends. A 12 0z honey bear is only one cup of honey. Honey measures differently than other ingredients. ugg.. I haven't had a drink in 15 years...how do i make honey simple syrup? Stick the water and honey in a pot. Bring it to a boil/simmer, until the honey has sufficiently dissolved. Sounds like you make a lot more than you need. I was thinking about using a half cup of each, instead. Any tips on making this drink kid friendly? What is the best replacement on the whiskey?